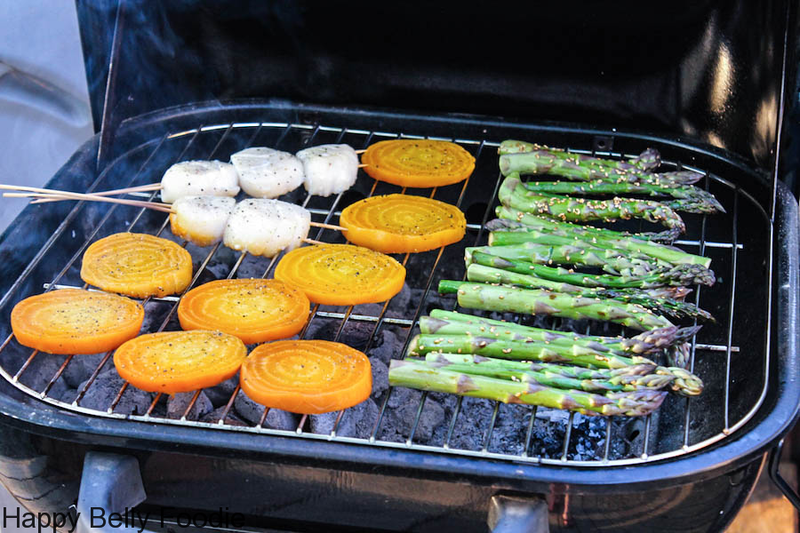 Grilled Scallops, roasted golden beets and fresh asparagus make a terrific fresh meal on the grill. Yes please! will make getting the charcoal started so much easier for you, so treat yourself and buy one if you don’t already have one. They’re inexpensive and well worth the investment. I had some left over roasted beets in the fridge and grilling them was a great way to use them up. Plus, they really taste good like that. Even the left overs after grilling taste great cold. I’m actually eating them as I write this 🙂 Great breakfast, huh? The asparagus basically just steams on the cooler side of the grill while the scallops get done fast over the direct heat. The beets get the heat in the middle (that sounds like a lyric, lol) and since they’re already pre-cooked there’s not much fuss with them. I did want to mention that roasting beets is really simple. You just wrap them in foil and put them in a 425 degree F oven for 45 minutes. Eat right away or refrigerate after cooling. You can use them salads, pastas or whatever ingenuous idea you come up with. And they’re really good for you, too. The sauce I topped the scallops with was actually a hot banana pepper butter that I snatched up and bought after tasting a free sample from Dixie View Nursery. Here’s their page, https://www.facebook.com/Dixie.View. You can find them at The Friendly Market in Florence, KY on the weekends. This stuff is uber-delish! And it went perfectly with my scallops! Soak the wooden skewers in water for at least 1/2 hour to keep them from burning on the grill. Prep the charcoal for the grill in a chimney starter and light. Clean the grate and with a paper towel coat it with a thin layer of canola oil. Dry the scallops very well with a paper towel on all sides. Season them with salt and pepper. Place two skewers through two to three scallops, parallel to each other to hold them together and keep them from falling through the grill grate. Put the scallops on a plate in the fridge until ready to cook. Peel and slice the beets to 1/2 inch thickness. Lightly coat them with the olive oil and season with salt and pepper. In a large baking dish, lay the asparagus out in a single layer. Pour the sesame oil and soy sauce over them. Toss to coat and sprinkle with sesame seeds. Lay the hot charcoals down on one side of the grill. Put the grate in place and close the lid to get it hot. Once the grate is hot, put the skewered scallops directly over the hot coals. Place the beets next to them and on the farthest side from the heat, lay the asparagus down. Cook the scallops for 2-4 minutes on each side and take them off the grill. Flip the beets over and place them directly over the hot coals until nicely browned. Carefully move the asparagus to cook on all sides and remove when bright green and done to your liking. Top the scallops with your favorite sauce and serve them with the veggies. Soft Shell Crabs ~ A crustacean lesson with lots of pics!